activity during different sleep stages in a healthy brain. The field of sleep research has been a popular and controversial one ever since it began in the early 1900s. 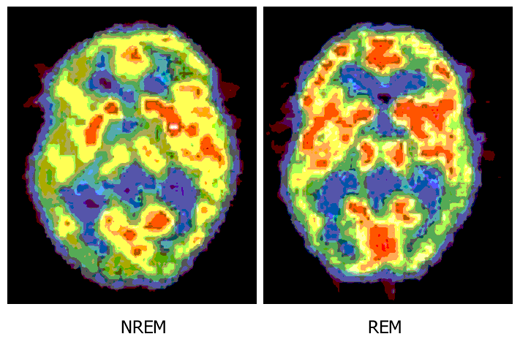 The discovery of REM sleep in 1953 was a huge turning point in the field, and directed research to looking at the different phases of sleep and their relation to the body’s circadian rhythm. Currently, we know very little about sleep aside from the fact that it is in some way related to learning and memory, certain hormones, and patterns of brain function. Scientists used to think that all animals required sleep, however recent studies have shown that this may not be the case. Animals such as the toad have been proven to not need sleep to learn and function properly. Our neurowiki will look at four broad areas of sleep, namely physiology, patterns, sleep deprivation and sleep disorders. We aim to give readers an overview of this incredibly broad and dynamic field. 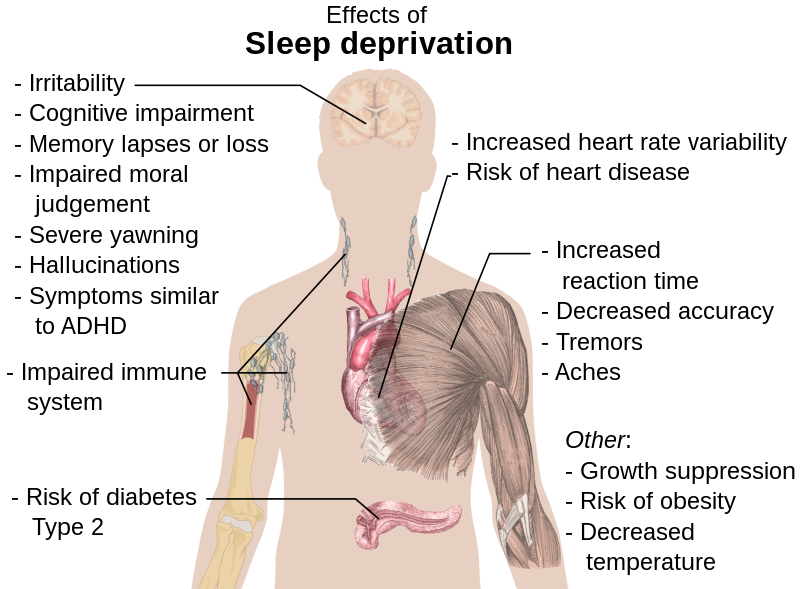 Some of the physical and mental manifestations of sleep deprivation. Sleep deprivation (SD) can be defined as either complete lack of sleep, or just not getting enough of it, as is very common in contemporary Western lifestyles. Sleep plays a crucial and complex role in the brain and body, and is necessary for many different cognitive and homeostatic functions. Sleep deprivation, especially when chronic, can therefore have multiple detrimental effects on the brain and body. General cognitive function and cellular processes are impaired in areas such as attention, emotion, learning and memory. Other manifestations of sleep deprivation include reduced coordination of movement, fatigue, irritability, micro-episodes of sleep, and may involve hallucinations or other perceptual disorders. This section of the neurowiki on sleep will be focusing on cognitive impairment caused by SD, its effects on metabolite clearance, and will conclude with a suggested optimal sleep schedule for learning. 1. Orzel-Gryglewska, J., Consequences of Sleep Deprivation. Int J Occup Med Environ Health. (2010) 23:95-114. 2. Alkadhi, K., Zagaar, M., Alhaider I., Salim S., & Aleisa, A., Neurobiological Consequences of Sleep Deprivation. Curr Neuropharmacol. (2013) 11:231-249.
to the updated version of International Classification of Sleep Disorders (ICSD-2), there are approximately 81 sleep disorders that can be characterized into 8 categories. 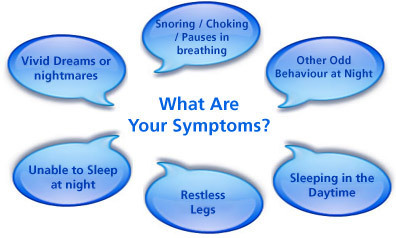 These disorders have been shown to have an affect on an individual's sleep, their cognition, ability to function properly during their daily lives and in some studies it has also been shown certain sleep disorders have been associated with causing major diseases or have been identified to be the precursors of other diseases. As a result, the significance of unwrapping the mysteries around these sleep disorders has become even more important as they have shown to drastically change a person’s life. As an example, a recent study reported in the journal Movement Disorder has made an association between Restless leg syndrome (RLS) and Parkinson’s disease (PD), where some individuals with RLS compared to those without RLS were more likely to develop PD. Although this may not be a direct correlation and the fact it also requires much more research before such associations can be confirmed, this highlights the significance of examining symptoms, etiology and pathophysiology of sleep disorders to determine their treatments. For this reason, this page will be examining the three common sleep disorders and the research associated with them: Narcolepsy, Cataplexy and Restless leg syndrome. When talking about sleep patterns, there are many things that might come to mind; patterns during the daytime are one type, patterns of sleep stages during a single sleep are another and finally brainwave patterns during different stages of sleep/wakefulness. Each one of those possible interpretations has many subtopics that could be considered. Regarding daily sleep patterns, there are two different approaches to viewing this topic; possible patterns (monophasic and polyphasic ones) that one might choose to consider following – each with certain advantages and disadvantages is the first approach. Another perspective on this is considering possible underlying basis to each person’s patterns whether it be effects of genetics on the sleep pattern where it has been shown that there are genetic influences on sleep patterns in twins, environmental factors that might cause similarities between adults and parents’ sleep patterns, or effects of different physiological abnormalities/disorders like ADHD, chronic insomnia or pain on sleep patterns. The second possible interpretation when talking about sleep patterns is a single sleep’s patterns or sleep cycle patterns which includes the patterns of REM and Non-REM sleep. Here a special subtopic is dreaming. Dreaming is one thing that scientists have yet to completely understand the purpose of yet there are a lot of different theories to be discussed regarding this topic. The final possible interpretation is one regarding brainwave patterns during sleep. The brain’s electrical activity differs greatly throughout a sleep and when being contrasted with a wakeful state. The biological underlying origins behind that are interesting to consider. In addition, the contrast between those patterns and ones involved in different states of consciousness like hypnosis and meditation and what makes each state unique are topic that has been triggering a lot of interest lately. 1. Serge Brand, Markus Gerber, Martin Hatzinger, Johannes Beck and Edith Holsboer-Trachsler (2009) “Evidence for Similarities between Adolescents and Parents in Sleep Patterns.” Sleep Medicine(10):1124-1131. 2. Emily F. Law, Lynette Dufton and Tonya M. Palermo (2012) “Daytime and Nighttime Sleep Patterns in Adolescents With and Without Chronic Pain”. Health Psychology(31):830-833. Interesting topic :)! It would have been very interesting to sections about sleeping pattern in other animals and why babies and young children require more sleep than adults. Overall, very good job! I enjoyed reading your neurowiki!